Yes, we love FINGER KNITTING! 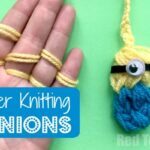 We have many finger knitting projects here for you on Red Ted Art already. But for those of that are keen to keep on Finger Knitting and always looking for new ideas, I am try and regularly come up with new finger knitted designs and projects. Finger knitting does not have to be long woolly scarves (though we like those too! 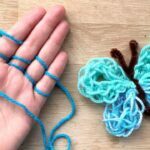 ), but we also have some fabulous alternative Finger Knitted ideas for you too – from Finger Knitted bunnies, to finger knitting heart ornaments! And of course we have lots of fabulous and delightful Owl DIYs for Autumn here! 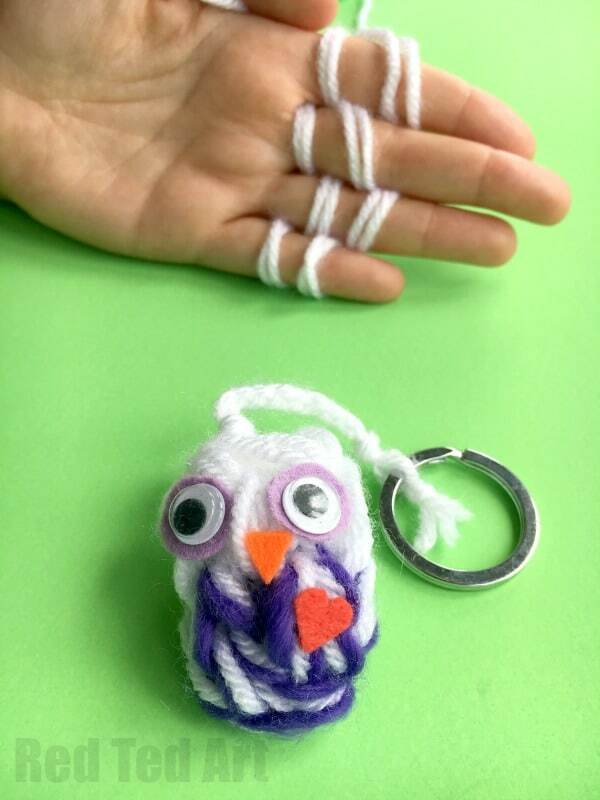 Today we have a little finger knitted owl, that you can use either as a key chain/ back pack charm or as a cute “snowy” owl ornament in fall/ Christmas. This project introduces a new skill too – changing the colour of your wool! 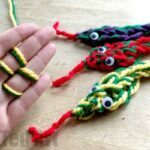 (Check out our Snake Finger Knitting project, which shows you how to “increase and decrease” finger knitting stitches, so cool!). As per usual, we have a fabulous little video how to, showing you how to make this little owl ornament, with some written instructions, for those who can already do basic finger knitting, below! 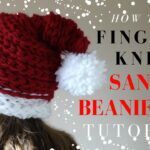 If you need to refersh your memory as to how to finger knit, watch the video below first! You will need to finger knit 3 rows of double white yarn (the three rows include the casting on – so cast on, knit your first row and then an additional 2 rows). 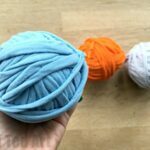 Now switch out ONE of your white yarn strips with the contrasting colour, you can either knot it in place now or later – I tend to do it later). Continue to finger knit another 3 rows and cast off. 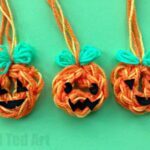 Knot off any of the pieces of yarn at the back. Weave into your finger knitting and trim. I keep the LONG PIECE of white coming out the owl’s head intact for hanging. Your basic yarn owl is now complete. Glue on the beak where the white and the mixed colours meet. 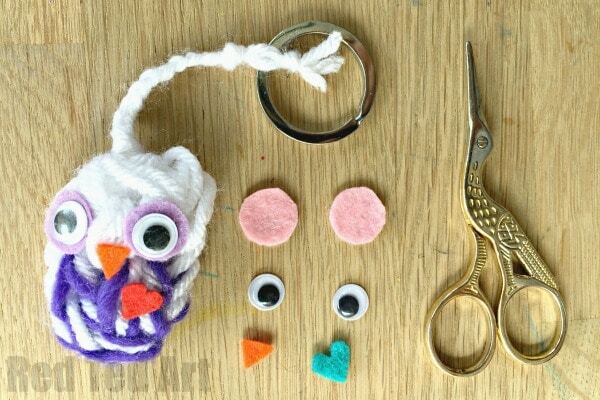 Then your remain pieces of felt and finally glue on your owl’s googly eyes. 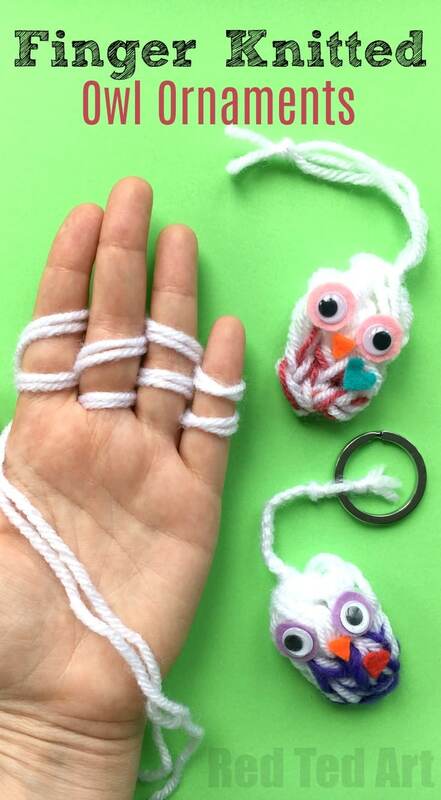 Now simply hang your little finger knitted owl or knot it onto a key chain. Finish! 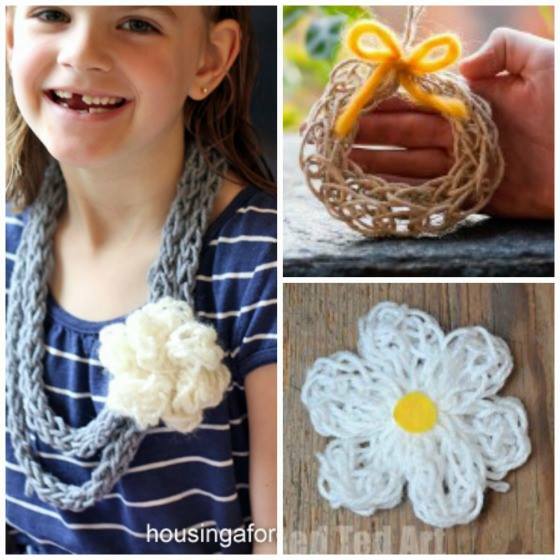 Such a super duper cute and easy finger knitting project for kids! I love how it draws on a new skill and introduces the concept of changing colours of yarn to kids. 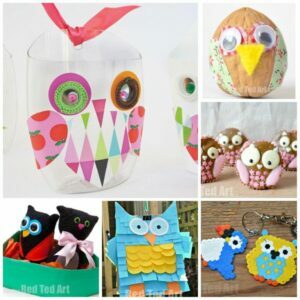 As well as for Owl Fans – these great set of Owl DIYs for Autumn! I will have to figure that one out!! !